Apple Stock Versus Gold: Which One Makes a Smarter Investment? To Apple lovers, their iPhones and iPads are as good as gold. But as an investment, is Apple stock as good as gold? Apple (AAPL) likely needs no introduction. Briefly, its products include iPhone, iPad, Mac, iPod, Apple TV and iCloud. Its operating systems are iOS for mobile devices and OS X for Macs. Apple hasn’t put much effort into Apple TV in the past, but that seems to be changing. In March, Apple inked a deal with Netflix that allows Apple TV users to subscribe to Netflix directly from their devices. 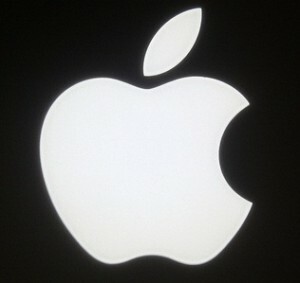 It’s also widely anticipated that Apple will be coming out with an entirely new Apple TV product in late 2012 or 2013. Apple’s iPhone 5 will be coming out this fall. And it’s highly speculated that Apple will be releasing a smaller screen — or “mini” – iPad this fall. This product is meant to compete head-to-head with smaller screen tablets such as Amazon’s Kindle Fire, Google’s Nexus 7, and Microsoft’s (soon to be released) Surface. Stock Price: $630 (Aug. 13). Apple’s stock is up from $565 when I chose it as my favorite tech stock in our Hunger Games series in March. The stock returned 68% over the past 1-year period (ending 8/13). P/E (forward) is 12. Operating and profit margins are 36% and 27%, respectively. Last quarter’s revenue growth was 23%, while earnings grew 21%. Slowing growth was expected, as people put off buying an iPhone when a new version is due out soon. Annually, earnings-per-share growth is 83%. An earnings growth rate of this magnitude would be impressive for any company, but for one as huge as Apple, it’s simply amazing. Return-on-Equity (ROE) is a fat 44%, the company has no debt and a boatload of cash ($27.5 billion). AAPL started paying a dividend this year — current yield is 1.7%. The stock is reasonably priced on a PEG (PE/Growth) basis. Though the magnitude of earnings growth can’t continue, the stock is still reasonably priced even if earnings growth slows to the 20% analysts’ expect. Gold is typically viewed as a “safe haven” investment for uncertain times. A major reason people buy gold is concern about the devaluation of the U.S. dollar and the resultant potential for increased inflation. 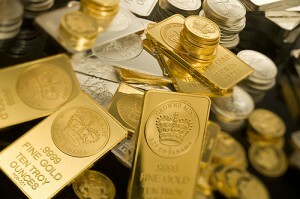 Typically, as the value of the dollar decreases, the price of gold increases. When the Federal Reserve increases the money supply – by printing more money – the value of the dollar typically declines. The Fed increased the money supply when it bailed out the banks and other companies after the financial collapse of 2008. The Fed also typically pumps money into the system during recessionary times to help stimulate the economy, as it did during the Great Recession with its two qualitative easings. Some expect a QE 3 in the near future. Buying an ETF is the “pure play” as it will very closely track the price of gold. The price of gold is only one factor in the price of gold mining stocks. Therefore, an investor wanting to invest in gold, but not concern him/herself with analyzing stocks, should stick with ETFs. One example is State Street Global Advisors’ SPDR Gold Shares ETF (GLD). I’m not recommending this particular fund, just using it as an example of an ETF which tracks gold bullion prices. Gold closed at $1,614.80 per ounce on Aug. 13. So, as you can see, gold ETFs aren’t priced on an equivalent basis to an ounce of gold. The ETF returned 6.3% over the past 1-year period (ending 6/30), and 19.4% over the past 3-year period. While these returns are far from Apple’s stock returns, it’s important to keep in mind that gold prices have had a tremendous run since the early 2000s. Additionally, past performance is not indicative of future performance. Here’s a chart comparing the 5-year performances of Apple’s (AAPL) stock, the gold bullion ETF (GLD), Randgold Resources’s (GOLD) stock, and the S&P 500 (a proxy for the overall stock market). Randgold is a gold mining stock. Its operations and interests are in West and Central Africa. The company, founded in 1995, is based in the Channel Islands. I included Randgold to show that while gold mining stocks can perform very well, they also tend to be very volatile. 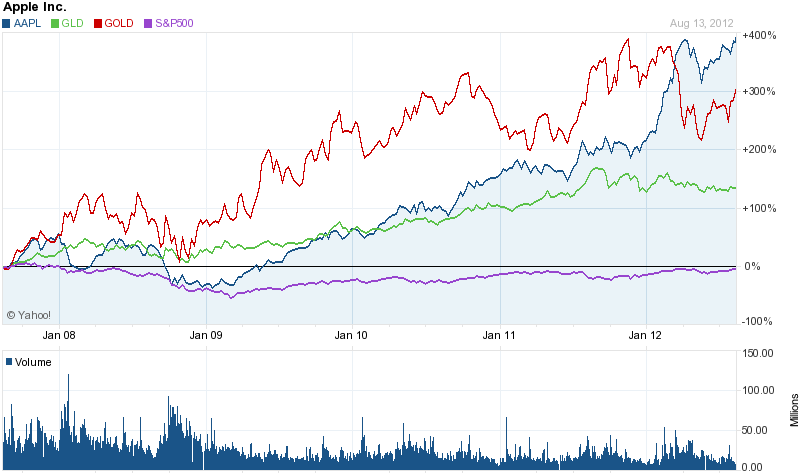 I think both Apple stock and gold still have lustrous years ahead. In a real life portfolio, I’d not pit Apple against gold, but consider Apple a good choice for a core stock holding and gold a good safe haven investment. That said, if I had to choose between the two, I’d go for Apple now as the better short-term investment. I think its mini iPad will do particularly well in the huge Chinese markets. I’d also not be surprised if it unveils a game-changing Apple TV soon. However, I think gold could be the better long-term investment, especially if the U.S. dips back into a recession in 2013-14 and/or if there is further financial trouble among the Euro countries. GOBankingRates > Investing > Stocks > Apple Stock Versus Gold: Which One Makes a Smarter Investment?